Motorola is part of a small subset of phonemakers that doesn’t take part of specification races, but focuses on delivering great value at attractive price points. As such, ever since the summer of 2011 when Google set its eyes on the company, Motorola has set its focus on the mid- and low-end of the phone spectrum and it appears things aren’t changing after the Lenovo acquisition. 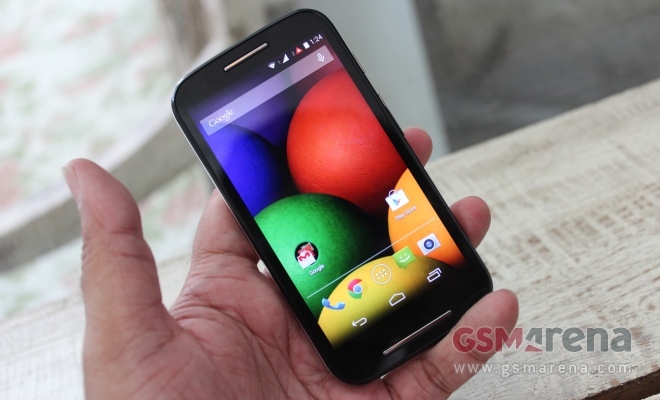 The Motorola Moto E is the company’s latest effort to capture the hearts of the budget-conscious smartphone customer. It did so with the Moto G, but it seems many of the boffins inside of Motorola though they can do better. 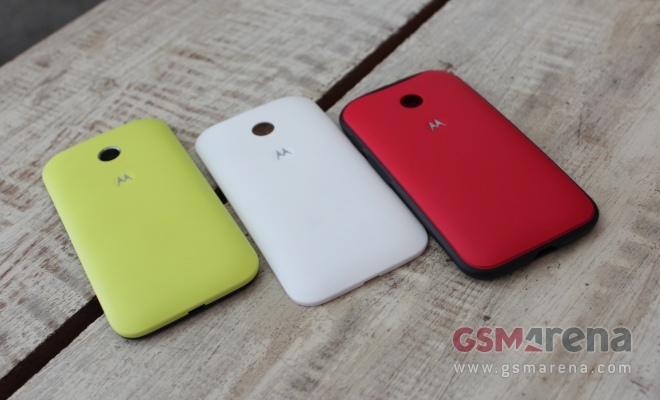 In terms of looks Moto E is quite similar to the Moto G, but with its belt tightened to achieve an even lower price tag. If you take a closer look, you’ll notice that on paper, the Moto E packs half of the potential of the Moto G. And yet in real life, it doesn’t. That’s what we discovered in our hands-on time with the phone shortly after its announcement. It features a similar design to the Moto G and Moto X and its nicely curved back feels great in the hand. The Moto E features a lot of soft edges, which further help the handling. The phone weighs 140 grams and is 12.3mm thick, which won’t win it any model contests. Motorola, however, firmly stands behind its beliefs that real smartphones have curves. Jokes aside, the great feel in hand is also helped by the build quality. You’ll be hard-pressed to get a squeak or a wobble by the phone’s plastics. We’re not really fans of the front speaker grilles – on the white Moto E, they look out of place (they’re more tolerable on the black version). Motorola has done a great job at making the phone sturdy and has even made it splash-resistant. We couldn’t confirm if the company is using the same nano coating that wraps the innards of the Moto G, but if that’s the case, then count us impressed. There’s even a Gorilla Glass 3 on top of the display, which should make it harder for keys and other sharp objects to scratch it. Speaking of the display, it’s a 4.3″ in size and with qHD resolution (that’s 256 ppi pixel density). It is reasonably sharp and produces decent colors. It is reasonably bright, too, but looking at it from an angle is not a pleasant experience – there’s notable contrast compression and color shift. Under the hood, there’s a 1.2GHz dual-core Cortex A7 CPU bundled with 1GB of RAM sitting on a Snapdragon 200 system-on-a-chip. We were pleasantly surprised with its performance while running Android 4.4.2 KitKat. Everything was decently quick with no notable stutters or lag, despite the modest nature of the CPU. Motorola is synonymous with great software optimization, and it has manifested in the Moto E with full strength. The company preloaded the phone with a bunch of interesting applications. One of them is called “Meet me / Follow me” and it’s intended to help you track down a friend in a crowded area. “Location status” offers a similar functionality as it sends your location via a text message to a person of your choice. There are also “Motorola Alert” and “Emergency mode” which turns on the phones alarm and notifies a designated contact in a case of emergency. Motorola extends its promise to aptly bring the next major Android update to the Moto E. It says that it took just 19 days for the Moto X to receive Android KitKat, while it took other flagship close to 100 days to do the same. Anyway, below the changeable back cover of the Moto E lies a 1,980mAh battery and Motorola reckons it can power the phone for a full day. The back also holds a 5MP camera sans LED flash (probably to keep cost in check). We weren’t able to test it, but we doubt anyone into cameraphones will seriously consider this one anyway. What’s good, however, is that Motorola has finally put a microSD card slot on one of its phones. The Moto E’s 4GB of internal storage, of which just 2.21GB is available to the user, wouldn’t get you anywhere. A 32GB microSD card is the maximum you can use, but it’s more than enough. The Moto E also features an FM Radio. You can get all of this for just £89 in the UK or $129 in the US. The phone is also available in dual SIM configuration and sports Black, Turquoise, White, Pink, Blue, Red and Lemon back panel options. If you think the Moto E is just too basic for your needs, Motorola today announced an enhanced version of the Moto G with LTE and a microSD card slot for £149 and $219 in the UK and US, respectively.